Greetings, Justice in Conflict readers. For those who don’t know me, I’m a political scientist and former human rights lawyer, currently based at Stanford’s Center for International Security and Cooperation. I also run the blog Wronging Rights. I spend most of my time writing and thinking about the dynamics of mass atrocities and the politics of justice for serious international crimes. For obvious reasons, the rest of my time is spent consuming a steady diet of brightly-colored, loosely-plotted TV comedies, bourbon, and chocolate. In general, I’ll be covering events from the post-WWII era, because that’s when the possibility of prosecuting the perpetrators of atrocities became A Thing. But I reserve the right to make an occasional side trip into Ye Olde Historical Carnage. So, buckle up. Today’s atrocity is the 2005 massacre in Andijan, Uzbekistan. 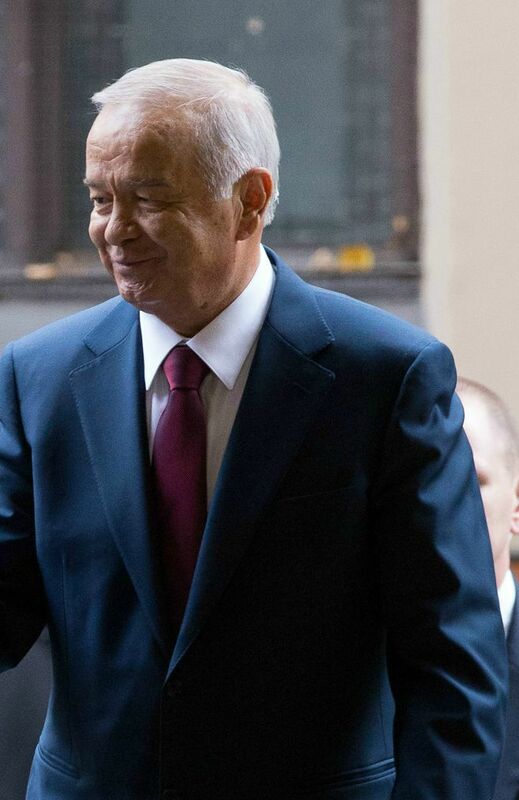 Islam Karimov, President of Uzbekistan. Uzbekistan’s president, Islam Karimov, has been in office since before the country declared its independence from the U.S.S.R. in 1991. He’s kept a tight grip on power by repressing civil society, censoring the independent media, and occasionally boiling his opponents to death. Harsh anti-Islamist policies have routinized targeting and harassment of Uzbekistan’s Muslim community. After the 9/11 attacks, Karimov’s regime benefited from the opportunity to recast these policies as part of the Global War on Terror, in part because of Uzbekistan’s role as a critical partner in the U.S.’s campaign in Afghanistan. Human rights groups say that more than ten thousand Uzbek Muslims have been jailed since 2002, many of them facing torture during their detention. In May of 2005, the arrest and trial of 23 local businessmen sparked a conflagration in the eastern city of Andijan. The men were accused of membership in the Islamist organization, Akramiya. At the time, observers suggested that this was pretext, and that the men were simply being targeted for a refusal to pay bribes. When their verdict was postponed, armed supporters staged a prison break the night of May 12 and seized control of a nearby government building. Emboldened by their actions, crowds of protestors gathered nearby calling for an end to injustice. But instead of meeting their demands, the government responded with deadly force. According to eyewitness testimony, Karimov’s forces opened fire on the protestors with no warning. Unarmed civilians were killed as they attempted to flee. In the aftermath, the death toll was hotly contested. Rumors spread about covert military operations to remove the bodies and mass graves outside of town. Eventually, the Uzbek government acknowledged the deaths of 187 people, most of whom were “terrorists”. Human rights groups put the total much higher. On the 10 year anniversary of the massacre, Human Rights Watch reiterated its belief that hundreds of unarmed civilians were killed by their government that day. Some of the Andijan protesters escaped across the border into Kyrgyzstan. For those who remained, the situation was precarious. In the aftermath of the massacre, Karimov launched a vicious crackdown against anyone who might threaten his stranglehold on power. Journalists who had covered the events at Andijan were forced to flee, and almost every foreign NGO found itself expelled from the country. While members of the international community called for an independent investigation into the massacre, the government pursued criminal charges against those suspected of involvement in the “uprising”, and convened a window-dressing parliamentary commission to validate the official narrative of an attempted Islamist revolution. In the months following the massacre, the Karimov regime’s relationship with the West soured. Uzbekistan lost millions of dollars in aid and arms sales, and, angry about Western interference, ended its air-base agreement with the U.S. But the estrangement didn’t last. The EU lifted its arms embargo in 2009, the U.S. in 2012. And just in time for the Andijan massacre’s 10 year anniversary last May, the U.S. announced a new five-year plan for military cooperation with Uzbekistan. In retrospect, Karimov’s approach of brutal repressing civil society while waiting for international attention to wane looks smart. With domestic demand for justice suppressed, and international demand subordinated to strategic concerns, for now, at least, he’s gotten away with murder. This entry was posted in Mass Atrocity Monday, Uzbekistan and tagged Islam Karimov. Bookmark the permalink.